The Pontifical Academy of Life is holding a two-day workshop 25-26 June. Pope Francis met with the participants on Monday and shared his thoughts with them regarding the theme: Equal Beginnings. But then? A global responsibility”. Pope Francis began saying that “human ecology” needs to be encouraged to consider “the ethical and spiritual quality of life in all of its phases”. Scientific studies on the human person are important, but need to be integrated within the broader realization of the person’s origins. Human life “burst on the world scene with the wonder of word and thought, of affections and spirit”, the Pope said. When babies are exposed to privation and war; when the old are abandoned—“we instead perform the ‘dirty’ work of death”, Pope Francis continued. Christians must be strong in their inspiration and commit themselves ever more vigorously to work against such works sustained by sin, he said. Christian bioethics must not define the value of a person beginning from illness. It must begin with the “profound conviction of the irrevocable dignity of the human person, just as God loves each person” through every phase and in every condition of life, Pope Francis said. A holistic vision should situate the person within the context of both the connections and differences we live, beginning with the human body. 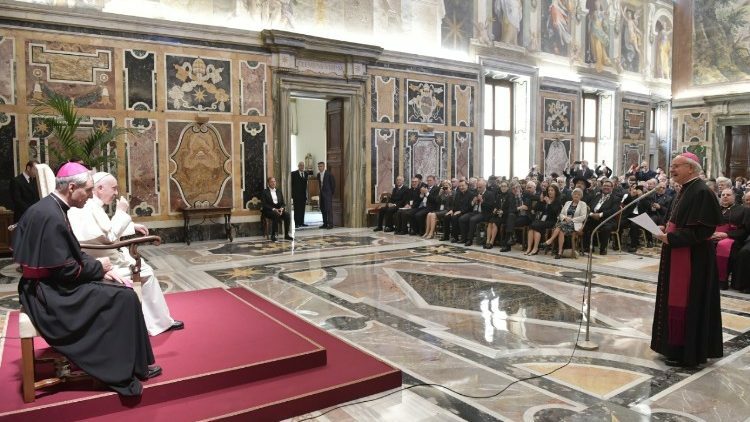 “It is through our body that the human person is in relationship with the environment and other living beings”, the Pope said, quoting Laudato Si’. Those who understand the world as God’s gift have first accepted their bodies as God’s gift, he said. Relying on purely legal regulations or technical assistance in the bioethics field will never guarantee the dignity of the human person. That can only come from the “adequate support of a responsible human proximity”, Pope Francis said. A culture of life always looks toward life’s ultimate destination, Pope Francis concluded. Christian wisdom must passionately contribute to the thought that “humankind is destined to share in God’s life” after death where we will remain in eternal awe before all things “ ‘visible’ and ‘invisible’, hidden in the Creator’s womb”.